Deborah Griswold was born on 6 May 1661 at Norwich, New London Co., CT. She was the daughter of Francis Griswold and Sarah (?) Deborah Griswold died in 1704. [S116] Esther Griswold French and Robert Lewis French, Griswold, Page 28/Item 17. Lydia Griswold was born in June 1663 at Norwich, New London Co., CT. She was the daughter of Francis Griswold and Sarah (?) Lydia Griswold died in April 1664. [S116] Esther Griswold French and Robert Lewis French, Griswold, Page 16/Item 18. [S52] Henry R. Stiles History of Ancient Windsor II, Vol. II:Pg. 352/Family 11. [S116] Esther Griswold French and Robert Lewis French, Griswold, Page 28/Item 19. [S116] Esther Griswold French and Robert Lewis French, Griswold, Page 30/Item 20. [S116] Esther Griswold French and Robert Lewis French, Griswold, Pages 16, 30/Item 21. Daniel Griswold was born on 14 February 1684/85 at Windsor, Hartford Co., CT. He was the son of Daniel Griswold and Mindwell Bissell. Daniel Griswold died in March 1684/85. [S116] Esther Griswold French and Robert Lewis French, Griswold, Page 32/Item 62. Jonas was the emigrant to America that founded the Westover family of New England which spread throughout America. Jonas came from England. The family lived in Taunton, Somerset where he was born. The exact date of his arrival in America was not definitely determined as of a search performed in October 1961 in the New England records. Early genealogical records give Jonas as a boy of 14 years of age arriving in Simsbury, Connecticut in the year 1654. This would give a birth date of the year 1640. Other dates give some substance to this date. He became a freeman in 1658, he received title to a lot in Simsbury and he was married in 1663 -- he became a freeman at the age of 18, a propertty owner at 21 and married at age 23. Other sources state that a Jonas Westover was in Windsor in the year 1649 and assume this Jonas to be the Jonas from England born in the year 1620. These sources give this Jonas as the one who married Hanna Griswold in Simsbury. Further research may be needed to establish the correct birth date of the emigrant. Jonas Westover entered America through Massachusetts Bay, as that was the most commonly used entry at that time to the New England area. He had relatives there when he arrived. One relative was Jane Westover who had married 20 November 1647 William Williams. Jane lived in the Simsbury area of Connecticut at the time of Jonas' arrival in Windsor. After the birth of their first child they moved southward to a new settlement called Killingworth. The move was made with the father-in-law's family, the father-in-law having helped found the new settlement. There they lived for about eleven years and then moved back to Simsbury. Jonas and his family had been active members of the established First Church of Killingworth. Jonas came to Simsbury, Connecticut, in New England before 1654 and died there in 1708/9. George came ahead of his family on the Mary and John to Dorchester and in 1636 to Windsor where he was a surveyor and Indian trader. He later moved to Fairfield. As a follower of Roger Ludlow, he was instrumental in establishing the commonwealths of Connecticut and Massachusetts. Mary Griswold was born on 15 March 1670/71 at Windsor, Hartford Co., CT. She was the daughter of Ensign Joseph Griswold and Mary Gaylord. Mary Griswold married Joseph Gillett on 17 May 1692 at Hartford, Hartford Co., CT.2 Mary Griswold died on 9 December 1719 at age 48. [S116] Esther Griswold French and Robert Lewis French, Griswold, Page 37/Item 32. [S116] Esther Griswold French and Robert Lewis French, Griswold, Page 37/Item 33. Abigail Griswold was born on 11 August 1689 at Windsor, Hartford Co., CT. She was the daughter of Ensign Joseph Griswold and Mary Gaylord. Abigail Griswold married Josiah Phelps June 21,1711 at Windsor, Hartford Co., CT.
[S116] Esther Griswold French and Robert Lewis French, Griswold, Page 39/Item 36. Mary Bemis was the daughter of James Bemis and Sarah Dimond. Mary Bemis married John Griswold, son of Edward Griswold and Margaret (? ), on 28 November 1672 at Killingworth, CT. Mary Bemis died on 27 October 1679. Bathsheba North was born in 1654. She was the daughter of Thomas North. Bathsheba North married John Griswold, son of Edward Griswold and Margaret (? ), circa 1680. Bathsheba North died on 19 March 1736. [S116] Esther Griswold French and Robert Lewis French, Griswold, Page 24. Abner R. Holcombe was born on 18 September 1824 at Norwich, Chenango Co., NY. He was the son of Robert Burgess Holcombe and Maria Harrington. George Holcombe was born on 2 June 1826 at Norwich, Chenango Co., NY. He was the son of Robert Burgess Holcombe and Maria Harrington. George Holcombe died on 19 July 1828 at Norwich, Chenango Co., NY, at age 2. Leroy E. Holcombe was born on 19 June 1828 at Norwich, Chenango Co., NY. He was the son of Robert Burgess Holcombe and Maria Harrington. Leroy E. Holcombe died on 22 April 1852 at Geneva, Ontario Co., NY, at age 23. Calpurnia D. Holcombe was born on 7 July 1830 at Norwich, Chenango Co., NY. Calpurnia D. Holcombe was the child of Robert Burgess Holcombe and Maria Harrington. Catherine D. Holcombe was born on 7 March 1833 at Norwich, Chenango Co., NY. She was the daughter of Robert Burgess Holcombe and Maria Harrington. 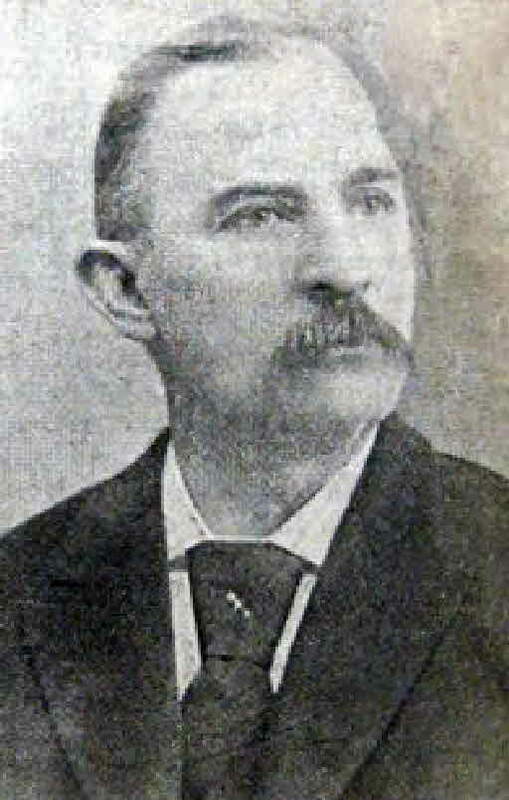 Bradford F. Holcombe was born on 15 April 1835 at Norwich, Chenango Co., NY. He was the son of Robert Burgess Holcombe and Maria Harrington. Bradford F. Holcombe married Esther Matthews, daughter of Moses R. Matthews and Mary Smith, on 6 March 1866.1,2 Bradford F. Holcombe died on 21 October 1902 at Fostoria, Seneca Co., OH, at age 67.2 He was buried on 24 October 1902 at Old Holcomb Cemetery, Huntington Twp., Gallia Co., OH. Bradford F. Holcomb was an assistant surgeon with the 36th Ohio Volunteer Infantry from October 10, 1861 until 27 July 1865. Bradford and Esther were enumerated in the 1880 Lick, Jackson Co., OH, federal census. He was a Physician surgeon, age 42, she was 43. Children in the household were Willard A. 12, and Bertha 6. While most folks believe the 1890 census was destroyed in a fire, Bradford appears in a Special Schedule of Surviving Soldiers, Sailors, and Marines, and Widows. At the time he was in Jackson, Jackson Co., Ohio. Bradford and "Ester" were enumerated in the 1900 Jackson, Lick Township, Jackson Co., OH, federal census. He was a physician, age 65 (born Apr 1835), she was 63 (born July 1836). Also in the household was daughter Bertha Jones 26, son-in-law Lloyd Jones 27, and granddaughter Ester B. Jones. Bradford F. Holcomb born near Norwich, Chenango County, New York, April 15, 1835, worked on his father’s farm in boyhood, took pride years afterwards in pointing out the stone fences still standing which he helped to build, was educated at Norwich Academy, taught school and began the study of medicine, came to Vinton in Spring of 1858 to visit his uncle Hon. Anselm Holcomb, and continued medical studies with Dr. Ira Holcomb. Here he recovered his health, found his best friends, his chosen helpmate and his happiness. Here he was initiated into the Masonic brotherhood, of which he was a lifelong member. Here he enlisted in the Army of the Republic, first as Lieutenant of a Company of Cavalry, and afterwards in old company B of the 36th Ohio Volunteer Infantry commanded by Colonel, afterwards General Geo. 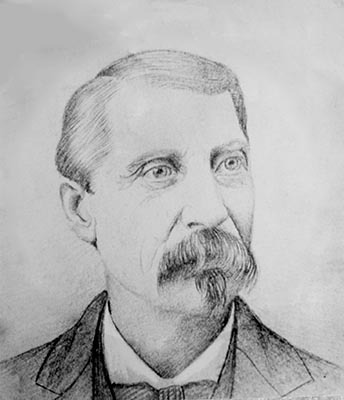 B. Crook, and famous as an Indian fighter after the Civil War, first as Hospital Steward, then being promoted to Assistant Surgeon, with the rank of Lieutenant, “Doc” Holcomb, as his old comrades affectionately called him, accompanied his fighting regiment throughout the war, South Mountain, Antietam, Chicamauga, Missionary Ridge and Lookout Mountain are some of the battlefields whose names are inscribed in bloody letters on the banner of this regiment, which also held the field at Winchester when Gen. Sheridan made his celebrated ride. His was not the fierce joy of battle, although it was said that no surgeon could keep his ambulances closer to the firing line, and no one responded more quickly to a wounded comrade’s call than Dr. Holcomb. His, rather the long, silent battle with Death in the scantily equipped field hospital, where diseases killed more than bullets. He anticipated modern antiseptic treatment by scrupulous cleanliness , and although his nurses grumbled at the amount of water they had to carry, he seldom lost a case from gangrene or amputated a limb. Furthermore, he believed in humor as the best emollient for all ills, and his unfailing cheerfulness and flow of he quaint, dry wit, did more than medicines in healing that homesickness which is worse than wounds. There are still many old veterans here who can recall the Doctor in his army days, and many of them owe their lives to him. Of all the offices he was ever called upon to fill, the presidency of his old regimental reunion held at Rutland probably made him proudest, and on that occasion he made his only public speech on record. 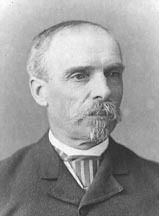 Returning from the war, he wedded Esther Matthews, daughter of Judge Moses R. Matthews, and moved to New York, where he began the practice of medicine. Again his health failed, and he returned to Ohio, taking up his residence in Jackson, where for nearly a full generation, he ministered unto the physical ills of man, and mingled in the business and social world as one of the best known and respected citizens of Jackson. Still he loved to return to Vinton at intervals, and especially to the old farm at Beach Hill, which he undertook to manage until his health failed. For years he had suffered from rheumatism and heart trouble contracted during the war, and the climax came in the form of a stroke of paralysis. For a year he battled with pain and weakness, which he had combated so many years for others but was unable to overcome himself. And now his remains are brought back here to rest amid the scenes he loved so well; among the old friends and comrades of his young manhood, and beside the baby daughter who died at Beech Hill nearly thirty years ago, and lies buried in the old graveyard on the hill. He leaves a widow, a son, and a daughter to mourn his loss. [S563] Nona Gwynn Holcomb Press, "Bradford F. Holcombe," e-mail to James H. Holcombe, 26 April 2005. [S573] Letter, Nona Gwynn (Holcomb) Press to James Hallowell Holcombe, 16 June 2005. Robert Asahel Holcombe was born on 11 April 1837 at Norwich, Chenango Co., NY. He was the son of Robert Burgess Holcombe and Maria Harrington. Robert Asahel Holcombe married Abigail Adeline Johnson, daughter of Dr. Homer Johnson and Roxana Skinner, on 27 March 1861. Robert Asahel Holcombe died on 9 November 1913 at Ripley, Chautauqua Co., NY, at age 76. Robert and "Abba" were enumerated in the 1880 Ripley, Chautauqua Co., NY, federal census, ED 69. He was a farmer age 43, she was 40. Children in the household were Winfield 18, Hattie 16, Homer 13, Carrie 12, and Fred 7. Asahel and Abbie A. were enumerated in the 1900 Ripley, Chautauqua Co., NY, federal census. He was a farmer age 63, she was 60. They had been married 39 years; she had 8 births and 7 children were still living. Children in the household were Bertha B. 19, and Edith A. 17. [S25] Hannah McPherson, Holcombe Genealogy, Page 40.2/Item A-4-2-10-5-14-7. Lucy E. Holcombe was born on 4 February 1839 at Norwich, Chenango Co., NY. She was the daughter of Robert Burgess Holcombe and Maria Harrington. While on a visit to his niece, Mrs. George W. McNitt, on Fair street, this village [Norwich, Chenango Co., NY], A. Burdette Holcomb a well-known resident of Greene [Chenango Co., NY], was taken ill last Friday night and died Sunday. Deceased was born on a farm in the town of Norwich July 4, 1841. For the past 30 years he had resided in Greene, where he married Miss Alice Lyons. Mrs. Holcomb died several years ago. For some years Mr. Holcomb was manager of the Lyon Iron Works in Greene, but for the last 10 years he had been a traveling salesman, selling cigars. He was a man whom it was a pleasure to know, enjoyed a wide acquaintance and had many warm friends. Mr. Holcomb was educated at the Norwich and Oxford Academies and graduated in a medical course at Ann Arbor, Mich., but never followed the medical profession. He served in the civil war as a member of an Ohio regiment and was a member of the G.A.R. He was also a member of the Eastern light Lodge, F.&A.M. of Greene, and Malta Commandery, K.T. of Binghamton. Mr. Holcomb is survived by one daughter, Miss Anna B. Holcomb, of Greene; one brother, R.A. Holcomb, of Ripley, N.Y., and a sister, Mrs. F.B. Sweetland, of Sayre, Pa. His remains were taken to Greene Monday and the funeral was largely attended Wednesday, the services being conducted by the Masonic lodge. A delegation of Norwich Masons and several relatives and friends were present from this village. [S807] Find A Grave, online http://www.findagrave.com, Find A Grave, database and images (https://www.findagrave.com : accessed 12 November 2018), memorial page for Burdette Holcomb (1841–1905), Find A Grave Memorial no. 97532389, citing Sylvan Lawn Cemetery, Greene, Chenango County, New York, USA ; Maintained by Nate (contributor 47751239) . Maria A. Holcombe was born on 2 June 1843 at Norwich, Chenango Co., NY. She was the daughter of Robert Burgess Holcombe and Maria Harrington. Abigail Adeline Johnson was born on 27 March 1840. She was the daughter of Dr. Homer Johnson and Roxana Skinner. Abigail Adeline Johnson married Robert Asahel Holcombe, son of Robert Burgess Holcombe and Maria Harrington, on 27 March 1861. Abigail Adeline Johnson died on 30 August 1929 at Ripley, Chautauqua Co., NY, at age 89. Winfield Asahel Holcombe was born on 23 January 1862 at Norwich, Chenango Co., NY. He was the son of Robert Asahel Holcombe and Abigail Adeline Johnson. Winfield Asahel Holcombe married Catherine Cass Lumbard, daughter of Lucius Lumbard and Helen Hall, on 6 August 1890 at Ripley, Chautauqua Co., NY. Winfield Asahel Holcombe died on 9 December 1937 at Geneseo, Livingston Co., NY, at age 75. Winfield was an educator, Genesso, Livingston Co., NY, graduated from the State Normal School, Fredonia, NY, June 1886 and took post graduate courses in Greek, Mathematics, and Science; served as principal Ripley, NY school until 1891; moved to Geneseo Sept. 1922 to open the Normal School of which he remained principal until he retired June 1, 1934. Winfield A. and Catherine C. were enumerated in the 1930 Geneseo, Livingston Co., NY, federal census. He was a State Normal School Principal, age 68, she was 63. There were no children in the household. A school was named in his honor in 1932 that is now (renamed James B. Welles building) part of the State University of New York at Geneseo. [S25] Hannah McPherson, Holcombe Genealogy, Page 40.2/Item A-4-2-10-5-14-7-1. Catherine Cass Lumbard was born at Ripley, Chautauqua Co., NY. She was the daughter of Lucius Lumbard and Helen Hall. Catherine Cass Lumbard married Winfield Asahel Holcombe, son of Robert Asahel Holcombe and Abigail Adeline Johnson, on 6 August 1890 at Ripley, Chautauqua Co., NY. [S104] DAR DAR Lineage book, Vol. 31/Item 30934. Information on Albert is from Paul Platt, pep@platt.org. [S182] Social Security Death Index (on-line), Ancestry.com, SSDI, Ancestry.com, SSAN 016-10-7326. Robert Lombard Holcombe was born on 28 October 1892 at Ripley, Chautauqua Co., NY. He was the son of Winfield Asahel Holcombe and Catherine Cass Lumbard. Robert Lombard Holcombe died on 3 September 1893. Catherine Elizabeth Holcombe was born on 15 December 1894. She was the daughter of Winfield Asahel Holcombe and Catherine Cass Lumbard. Catherine Elizabeth Holcombe died on 19 November 1915 at age 20. Ruth Lombard Holcombe was born on 15 December 1894. She was the daughter of Winfield Asahel Holcombe and Catherine Cass Lumbard. Ruth Lombard Holcombe married Kenneth Creble on 25 October 1924. Ruth Lombard Holcombe died in 1974. Kenneth and Ruth were enumerated in the 1930 Albany, Albany Co., NY federal census. He was a lawyer. Frederick Burdette Holcombe married Harriet Fort. Frederick Burdette Holcombe was born on 28 April 1900. He was the son of Winfield Asahel Holcombe and Catherine Cass Lumbard. Frederick Burdette Holcombe died in May 1946 at age 46. Edward Louis Holcombe was born on 28 May 1903. He was the son of Winfield Asahel Holcombe and Catherine Cass Lumbard. Norma Edina Clapper was born on 17 June 1899 at Chatham, NY. She was the daughter of Charles A. Clapper and Jennie Patterson. Norma Edina Clapper married Albert Winfield Holcombe, son of Winfield Asahel Holcombe and Catherine Cass Lumbard, on 20 October 1923. Norma Edina Clapper died on 18 February 1991 at Scituate, MA, at age 91. Robert Winfield Holcombe was born on 18 February 1928 at Mount Royal Hospital, Montreal, Canada. He was the son of Albert Winfield Holcombe and Norma Edina Clapper. Robert Winfield Holcombe died on 22 June 1976 at Mobile, Mobile Co., AL, at age 48. Kenneth Creble married Ruth Lombard Holcombe, daughter of Winfield Asahel Holcombe and Catherine Cass Lumbard, on 25 October 1924. Kenneth Creble died on 6 October 1974. Harriet Fort married Frederick Burdette Holcombe, son of Winfield Asahel Holcombe and Catherine Cass Lumbard. Harriet Fort died in 1950. [S444] Cheryl Ruth Holcomb Vattimo, "Frederick Burdette Holcombe," e-mail to James H. Holcombe, 19 August 2003. [S182] Social Security Death Index (on-line), Ancestry.com, SSDI, Ancestry.com, SSAN 080-24-7990.